Forest Tree Service of Kingwood, Texas, handles a lot of tree trimmings, stump grindings and more. Did you know that Neil Leuck (who owns the company) once trimmed trees in New York City’s Central Park? Whether it’s serving residential, commercial or municipal clients in and around Kingwood, Forest Tree Service is consistently known for doing highly skilled work and for “immaculate clean up” of all their job sites when the work is done. 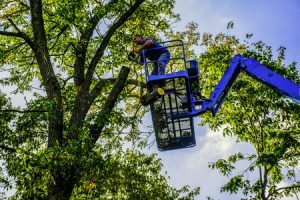 One of the questions people often ask is this: what’s the difference between tree trimming and tree pruning? Pruning is done for protection– these two words both begin with the letter “p” so you can easily pair them together in your mind to help you remember: pruning equals protection. What is being protected thanks to pruning? Well, if there are infected, dead or broken branches on a tree, pruning involves cutting them away in order to protect the tree from disease and to protect people and property from falling branches. Trimming, on the other hand, is done for design purposes. Say you have a tree that looks “odd” because one part is growing bigger and faster than another… or you have a tree that’s starting to hit the sides or roof of your house and it needs to be stopped… think of trimming as “taming” the tree so it looks its best. Trimming equals taming. When a tree gets trimmed, it’s like when a person gets a haircut. What used to be big and bushy gets cut so it’s not so big and bushy anymore. With trees, that can be a good thing, letting in more sunlight and moisture, helping the tree grow in a healthy way. To prune a tree typically involves hand shears and lopping shears which help remove buds/leaves and thick branches, respectively. If and when branches are really thick, saws might be used to prune. To trim a tree, shears may be used, but it’s much more likely that some sort of electric or gas powered hedge trimmer would be utilized for trimming purposes. As for when to do trimming and pruning, most companies trim twice a year and prune once a year. For flowering trees, pruning is typically done in the spring or winter. Timing often depends on what kind of trees you have; it’s best to have a free estimate to find out what can be done to maintain the trees you have on your property. Call Forest Tree at 281-381-4125.